Toyota's colorful i-Road vehicles have received unwanted attention in Grenoble. PARIS (Bloomberg) -- When the Socialists lost a French mayor's office to the Greens last March, the ripple effect spread as far as the Tokyo offices of Toyota Motor Corp.
Toyota was preparing to start its first electric car-sharing experiment outside Japan in Grenoble, a 160,000-person city at the foot of the French Alps. The incumbent had promised to install security cameras at all 27 planned charging stations for Toyota's i-Road, a quirky three-wheeled electric scooter that the company says can slalom through curves like one of Grenoble's skiers. New Mayor Eric Piolle, who had run on an anti-surveillance platform, refused to fulfill the previous administration's promises. After several instances of vandalism in the program's first three months slowed its introduction, there is now hardly a sign of the vehicles in the city center. The difficult start in Grenoble illustrates some of the challenges global automakers face as they enter the electric-car market, where local support for infrastructure is key. "When young people go out clubbing and get drunk, they can get rough," said Valentin Masso, a 25-year-old cook who moved to the city a few months ago. "These cars arouse their interest, and they want to play with them." Several i-Roads have been vandalized since their September debut, leading Toyota to install alarms. Police in Grenoble declined to comment. The i-Road is Toyota's effort to pioneer a new model for electric vehicles. With few places to recharge and limited driving ranges, the traditional auto-industry approach of making cars and letting customers sort out how to use them hasn't worked well for battery-powered models. Toyota instead is asking customers to pay to use its scooters, with the system designed to mesh with public transport. The Japanese company soon discovered that success would require strong political backing -- even in a midsize city like Grenoble. "Suddenly, we were told that security cameras were too intrusive," says Didier Leroy, who heads Toyota's European operations. "Elected officials may change, but commitments should be fulfilled." Piolle, 42, was notably absent at the Grenoble program's unveiling in mid-September. Attendees including Toyota Chairman Takeshi Uchiyamada and French Research Minister Genevieve Fioraso. The previous government approved the three-year project unanimously, said Michel Destot, the Socialist lawmaker who was mayor of Grenoble from 1995 to 2014. "The new mayor is an environmentalist, but he was elected with the backing of far-left parties for which working with big capitalist corporations such as Toyota represents a problem," Destot said. "He hasn't called the project into question, but he doesn't like to be photographed with Toyota." Piolle didn't reply to multiple interview requests by e- mail and phone. By the end of December, about 30 of 70 planned i-Road and four-wheel COMS vehicles were on the road, and about half the charging stations had been installed. Less than 30 percent of the 170 people trained to drive the vehicles regularly used the service. There had been an average of about 50 bookings in each of the previous four weeks. 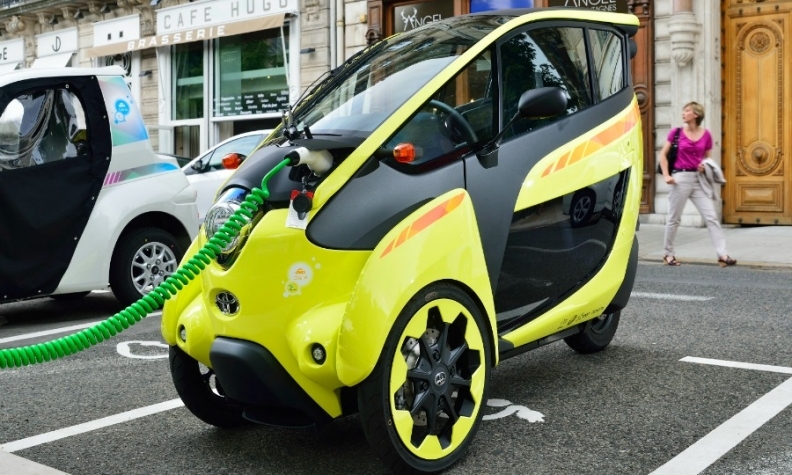 The Grenoble experiment is part of broader Toyota concept called "harmonious mobility" or "ha:mo," in which the carmaker considers electric vehicles as an extension of public transportation. Before coming to Grenoble, Toyota had only tested the idea in Toyota City, where vandalism is rare and people often leave their bicycles unlocked. "This looks fragile," said Ahmed Boudjeriou, 70, a retired driving instructor, eyeing a pink i-Road docked in front of a Grenoble clothing store. "I have a 27-year-old son, and I wouldn't recommend it to him." A similar system from French billionaire Vincent Bollore has had more success in Paris. Bollore's gray metallic "Bluecars" are bigger and more robust than Toyota's colorful electric vehicles and are intentionally left unpainted. They've multiplied since Bollore's Autolib made its Paris debut in 2011 with the backing of former Socialist mayor Bertrand Delanoe. Autolib now offers 900 charging stations and 2,900 Bluecars in the French capital, and the Renault-Nissan alliance started a car-sharing joint venture with Bollore in September after disappointing electric vehicle sales. For Toyota, the key is to learn from the three-year Grenoble experiment as it sorts out the business case for electric vehicles. At the very least, the i-Road has won some French fans. "We're pioneers, that's for sure," said Pierre-Louis Goirand, a technician for an engineering company, as he got out of a bright green i-Road with his 9-year-old son Louis. "The future is going to look like this."